I’m reaching out from eHow Home’s YouTube channel where we’ve been working closely with PBS star P.Allen Smith to create great gardening/design video tips and how-to’s the past few months. We’re big fans of your site and would love to work together to provide some of this content for your readers! I’d love to know what kind of information your readers would most want to know from P. Allen, as well. Just let me know your thoughts after you’ve taken a look at the channel [Redacted] and I can provide to the larger team to potentially be implemented in future shows/episodes. Let me know if you have any questions and I look forward to working together! Thank you for your Email today. You don’t have to introduce P. Allen Smith to me; I’ve been a viewer of his television show for years. I’m also aware of the partnership between P. Allen Smith and Demand Media. I got the PR blasts from Rubenstein Communications, Inc., back in March, and I follow his Twitter account so I’ve seen many tweets about this. I’m so excited about the possibility of you guys creating content for my readers that I’m about to wet my plants. You see, for years the “writers” that your company employs have been taking content from garden blogs like mine and changing a few words around and publishing them on eHow and Garden Guides. So it’s fitting that after years of creating content for you that you would now like to create content for me. I wonder if the content you help create for my audience will eventually be recycled into a post for your website like so may of my other posts. Would that be what they call irony? My blog is your blog. After all, my posts are already yours. Look, I know there are no new ideas, but it is a source of pride for me that what I’ve been blogging these past few years wasn’t ripped from garden books, magazines and other blogs. Sometimes a post can take up to a year to publish from the moment I have the idea to the moment it goes live on the blog. I don’t use stock photos and I don’t blog about things I’m not actually doing/growing in my garden, so my garden blog takes a bit of work. It’s not the best, but it’s mine, and this request is particularly grating considering. A Google search or two may have come up with results that would have indicated I was probably not the best blogger to approach with this pitch. I'm not a fan of Demand Media and I've been public about this. Lately I've been getting a lot of pitches that do not fit me, and it's getting a little annoying. There are search boxes on blogs, PR people, learn to use them. P. Allen Smith* has every right to make money and partner with whatever company he wants. As an admirer of what he has been able to accomplish I find it hard to promote what he’s doing when he’s associating with such unsavory characters as of late. * I met him last year at the Independent Garden Center Show and he was really personable. Even said that he’d read my tweets and in Awkward Penguin fashion I said, “That’s unfortunate.” You see, my Twitter feed is 95% me being stupid, 5% being an armchair activist, and 5% talking about gardening. So, it’s not something I’d really recommend for a serious garden professional. I'm of a similar opinion of Demand Media. I have a ton of my posts "refrenced" by eHow. the mad thing is the link they send our way is completely "nofollow". Not only do they steal content but they don't really give full credit to the people who made it in the first place. I've never met P.Allen Smith. He's done a lot with his career and I don't fault him for making a money form what he does. I think anyone would love to trade places with him but you're right, partnering with Demand media is a poor choice. You know, as I've been getting the Emails about this collaboration these past few months, you're one of the bloggers that have kept coming to mind. I've seen lots of your posts "referenced," as you put it. 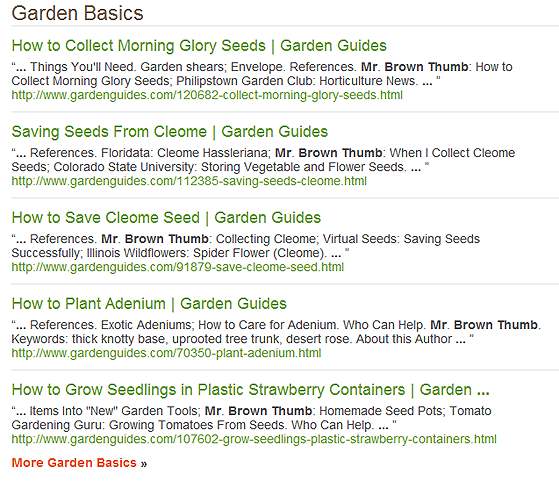 Over on Garden Guides they don't even link to the post they "referenced" it's just a plain text mention. I forget who, but someone once jokingly suggested that garden bloggers should get together and file a class action lawsuit against DM and request some of that IPO money. LOL. I doubt any of the people they "reference" would get anywhere, but it would be a hilarious troll. Holy crap I had no idea they were doing that. Good for you hun! Ok, as a former writer for Demand Media, I'll be honest and say what most of their writers do not want to admit- the writing model that DMS set up practically requires plagarism. As a gardening expert, I wrote hundreds of home, pond and gardening articles for them, and without fail, in order to be approved and paid, you had to provide a reference for every title/fact. That's not a bad idea... the problem is, that the content in your article has to state exactly the same things as the reference articles, for the most part. For example, even though I have made tons of DIY pond filters, and have found a technique I feel works best, it was kicked back to me, and I was told I had to use the exact instructions that were in the references. I use commercial air filter medium as a filter, but I was forced to write instead about using cotton batting instead, because that's what the referenced used- even though it's a poor filter medium. No original thought allowed. Essentially, what they wanted was word soup, aka plagiarism that will pass their plag flags. And, you were not allowed you cite yourself or your blog as a reference, even if you were an expert. You obviously couldn't quote verbatim without attribution, but the model really was one of just re-wording whatever the other site said. It wasn't really 'writing', it was word mashup. I took longer to write mine than most people, because I always tried to use at least 3 references for the various facts, so that it wasn't just re-wording one site. Of course, then I had to leave extensive notes explaining to the CE exactly where each fact was backed up in each of the references, or else the CE would get snarly and give me a bad score. Part of the problem was their format, and partly it was the editors. Getting paid a small set rate per article made them very annoyed if they had to check through various references to fact-check. I've looked at a lot of fellow DMS writers' articles (who claimed to write 3-4 articles an hour), and it was clear that essentially they were just changing every 4th to 5th word of the reference, or juggling the sentences a bit. And, it wasn't just other sites... I can't tell you while researching topics (before Panda) how many times I would come across multiple eHow and GG titles that clearly were plagiarizing /word mashing a different sHow or GG title. It was obvious when you saw the same factual errors in multiple articles that cited different references that they'd plagged another DMS article. DMS wanted high-volume content, but not original content, for low pay, and all they really cared about was that they not legally be accused of plagging. As far as the backlinks go- you're right, I've stated publicly and on their forums that using a site for reference with a no-follow link is low. For a while, we were able to use book references extensively (which I think is good, since it promotes their book), but they eventually started having a problem with that. They claimed it made checking facts too hard, but it's clear that it was because books don't provide a link to exploit. There is a reason there was a mass exodus of writers from DMS late last year- because they wanted to actually write, not do the mindless content mill crap that DMS prefers. We didn't want to be forced to just be 're-worders'. We were tired of being treated like crap, used and lied to, and we had serious problems with their company ethics. It is kind of ironic that eHow thought you'd be interested in 'working' with them, but not too sure it would be mutually beneficial. From my experience with their sneaky business practices, they probably want to embed their videos on your blog so that when YOUR readers click on them, it diverts them from your site and redirects them to DMS YouTube sites. They certainly have gall. Oh, an insider! Everything you stated is pretty much what I suspected and have seen other writers mention after they leave. The thing you've kind of touched on is the work that the editors do and how the model doesn't benefit them financially. It seems like writers can make a lot more money than editors and that it's a sore spot for the editors who do a lot of work. Tell me, did/do the writers there have something like your blog's dashboard where they can subscribe to RSS feeds? I ask because my blog/feed sometimes gets hits from a section of the DM website I don't have access to without joining and I'm curious about what it is. From the URL it looks like a place to list or keep resources for future reference. It's funny that the writers there copy from each other. I noticed that today when I was making the screen grab above. There were a ton of posts on how to save morning glory seeds similar to mine across eHow and GG and I wondered "just how many do they need?" Then I saw what you pointed out and had to laugh at the cannibalism. Not that it'll change how you feel about things, but I do think that the people at DMS deserve some kind of current voice. The above author mentions that what you describe was the case Pre-Panda, and it may have been -- I have always been an over-researcher, so my experiences differ from many. However, today's DMS, as of April 18, 2012, demands significantly higher quality than was ever considered before Panda. Our price point has gone up 56% and the titles are significantly more difficult. This is a good thing -- it weeds out those people who are creating garbage and sliding it through. Editors have received a large raise as well, I might add, and writers who are discovered re-writing are dealt with swiftly. That being said, the old DMS model was not necessarily beneficial to anyone. Today you must have actual time in the garden, on the job site or whatever to qualify to write at all. And you must write. Although the format tends to create some formulaic language, a simple rehashing of a single source will no longer do. As for the pond articles mentioned above, there is a new part of the guidelines that allows for people who have experience with these kinds of projects to draw from it and not be questioned if they can produce some kind of reference that makes their description seem plausible. This change would have benefited the above writer significantly. DMS is not my only client, I am a professional journalist and write copy for magazines as well as educational products, but I believe in DMS so I continue to produce copy for them. There are many people who need a place where they can go to find simple instructions, broken down into teeny steps. That is what we strive for, though some writers may have failed in the past. Times, they are a-changin', as they say. Something like 70% of the former writers have either left or been cut -- it seems that those high producers (3-4 titles an hour) are being targeted specifically due to quality issues. DMS is trying to clean up its act, but because of the nature of the web, these things take time. Some of our most horrible, embarrassing content is still accessible due to oversight or because of archiving. When you find a title that seems to be ripping off your site, report it to the company and they will deal with it. We have been told this time and again. No matter how you feel about DMS, though, there are only so many ways to save seeds, vegetatively propagate new plants or care for whatever botanical specimen that might have piqued your interest. As for the RSS Feed question, I have nothing that would allow me to subscribe in the manner described -- perhaps this is part of the internal fact checking machine. I'm only a writer, editors may have a different experience. Thanks for taking the time to read this, and let me assure you that DMS 2012 is a wholly new creature from what it has been. It's your prerogative to comment anonymously, but I have to admit that I take your insistence that DM has changed with a huge grain of salt. Basically, the grain of salt is the size of a boulder. I don't see how changing the way they operate at this stage, after they've gone public, will help their bottom line and make money for the investors. If anything I would think that continuing to churn out junk articles would help them to make more money. I'll have to respectfully disagree. In all the time I worked for DMS, it was flatly stated that in order to write for any specific topic, (like gardening), you had to have an education in the field, have been employed in the field, and provide proof of having published articles in that field. No different than it is now. Back then, some people with proper qualifications were denied, and I have it on good authority that plenty of previous writers who re-applied for their sections were not approved, even though they qualified. So, no, things have not changed in that area. Writers who have chosen to keep writing there are still having articles/projects rejected, even when their quality material exceeds the present guidelines. The inconsistency stays consistent. Also, the entire time I worked there, company policy was that if you presented your credentials to the CE, showing that you were an expert in the field, you were not required to present references, and you could write about topics based on your own experience, yet I routinely got hassled and had titles thrown back at me for following those policies- it wasn't worth it. Easier to just provide the references. So, that isn't really a 'new' policy, either. How anyone could know exactly what the rate increase has been, or what percentage of writers left or were forced out by the ridiculous policies that changed week to week, I don't know, unless you are a corporate employee, in which case, it's pretty cowardly to hide behind an anonymous avatar. Also, last time I checked, there were still $17 weird home and garden titles available, so it's not true that rates went up across the board, or that the model of titles/articles being requested has completely changed. There's still cheap, dreck titles there. I am really not going to buy into the lie that DMS is 'trying to clean up its act', suddenly they're all about quality. The truth is that many of the writers you claim were 'let go' because of quality issues were pumping out exactly what DMS demanded they produce, and they had the good scores and low reject/rewrite rates to prove it. It's disingenuous to suggest that the low quality was because of those writers- it was because although they were internally nit-picky for ego/control issues, they didn't have very high standards to aspire to. On purpose. All the while talking fluff every week about what high standards they have. It was all about volume, because they are all about money and stockholders. That goal will not change just because they're now producing video content mill crap or branching out into e-books. I can't speak for RSS feeds, because I really don't use them, but if it's a way for DMS to somehow drive traffic to their sites, I wouldn't put it past them. What other company would have the nerve to ask the people who produced content for them to market products they are selling (e-books) for free through twitter and other social media, and offer as an incentive the 'chance' to win one of 3 e-books? Mind-bogglingly clueless. I am not the first person who stated that the quality of a company and its products can be measured by how they treat their employees (in this case, contractors). This blogger is correct in staying as far away from DMS as possible, and it sounds like DMS should offer him an apology.